So MSI. This problem of uneven heat sinks continues from GT62 to GT63. When do you stop making uneven heat sinks ? May be enough ? Falkentyne and JNogueira like this. Prime 95 (Blended Torture Test) + Unigine Valley (1440p | 8x MSAA | Ultra) - I run the combined stress test for approx 5 minutes to determine max thermals. For stability testing, 30 minutes in the combined stress test. If it passes without errors/crashes, I will proceed to play games for a few hours. I can usually recognize instability well in advance by paying attention to fluidity and frame time inconsistencies. I have also noticed that the graphics tests in the Userbenchmark app will stutter in the event of GPU instability for me. Do not run MSI Afterburner in the background during these tests! You will notice hitching that coincides with the polling interval set in MSI AB as it interrupts the GPU to gather data on key operating metrics. In regards to CPU under-volting, I use Throttlestop with stock BIOS (-130mv). For a quick reference, an unstable CPU undervolt usually manifests itself through errors when running TS Bench (1024M) or intermittent freezing during the test. If it passes in TS Bench, I then move on to testing either in-game or via bench marking applications for comparison with previous runs. If anything is wrong, results will be out of the expected margin for error. This takes quite a bit of time and analysis though. Looking forwards to seeing your CPU core temperature differentials. Donald@HIDevolution and Pureownuge69 like this. GT63 owners, please share your AIDA64 tests (CPU + FPU + Cache + GPU) 5 min. as in the photo. My fan settings are 2nd photo. BTW if any of the portuguese GT63 owners around here want a samsung 2666 DIMM PM me! Also have you received your modded bottom panel yet? if so, can you provide some photos and and updates on temps, etc? Then go to Overclocking Performance Menu. You can set the negative/positive offsets there. i assume you are using adaptive voltage here. For Static you just key in the voltage and select override voltage. To be honest, if you unlock the bios, you are better off NOT undervolting and just going to CPU VR Settings->Core I/A Domain and set the IA AC and IA DC loadlines to 1. This basically does the SAME thing as undervolting without risking idle BSOD crashes. This also makes override voltage actually work without overvolting it by over 100mv compared to what CPU VID shows and what you entered as an override voltage. This is not guaranteed stable in all MSIbooks though. Works fine on the higher end Titan laptops. Not sure about GS65 or GT63. Anyone with GT 63 tried this? going to CPU VR Settings->Core I/A Domain and set the IA AC and IA DC loadlines to 1. Yeah I got it. Will post some pics later. Works great. Got a solid decrease in temps, specialy on the GPU side. Tops at 83C after a good gaming session, before was always glued on 90C and slight downclock. Now it's great! 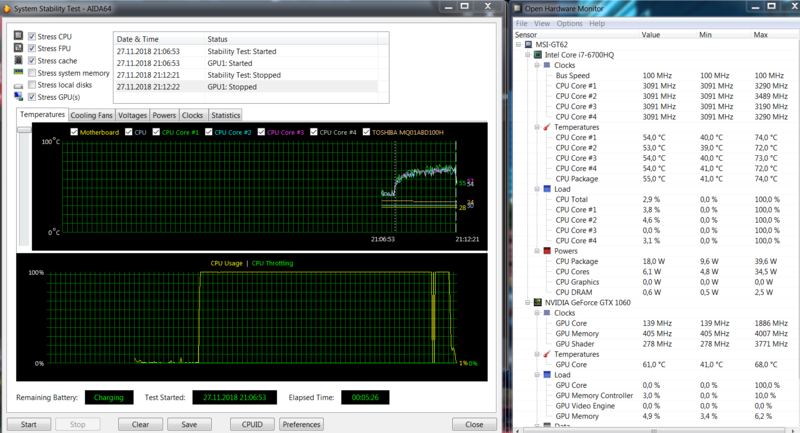 But I don't understand my CPU's behaviour. In BF5 it hover around 3.6Ghz or 3.9Ghz, about 50/50. I don't understand why it doesn't hold the boost longer. Temps are around 86C and it doesn't get close to 90 like before. A buddy of mine has a brand new GE63 8RF and hid 8750H holds 3.9Ghz for much longer. 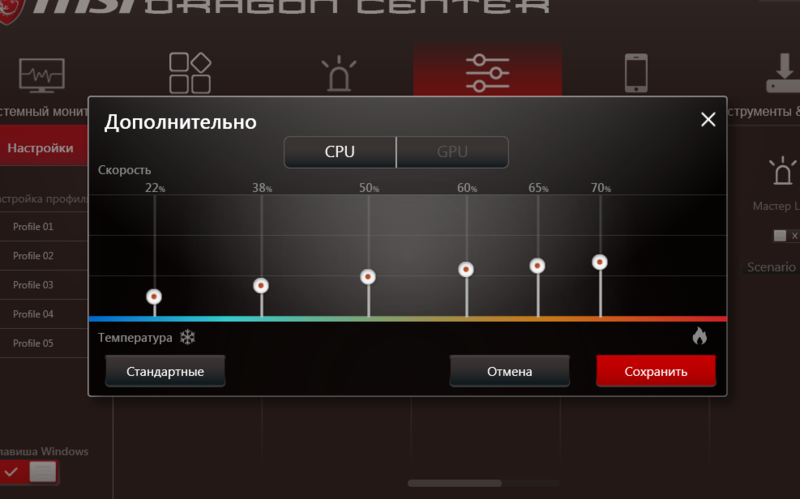 Dragon Center is set to Sport mode and I have it on High-Performance. Power or thermal issue, how much are your PL limits? Doesn't seem like a thermal issue, temps are under check. My PL limits would be stock as I don't have the unlocked BIOS nor do I have XTU installed. Only Throttlestop for undervolting. Try undervolt the gpu at 0,900V with a max clock of 1911Mhz with msi afterburner and test. With TS, you not checked any error in limit reasons? Talk with @JNogueira , he also have the same issue and i think that he solve the problem with the tip of @Falkentyne about tdp.